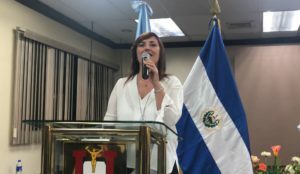 Today the Andrés Bello University in El Salvador presented Silvana Martinez with an Honorary Doctorate for ‘Dignifying the Social Work Profession’. The award was issued in recognition of the leadership role that Dr Martinez has performed in the Latin American and Caribbean region and worldwide. In her acceptance speech Dr Martinez, said, “Today, before all of you, with this honour granted to me by the Andrés Bello University, I redouble my commitment not only to the profession but also to all people throughout the world that are entitled to the best social work possible”. IFSW Secretary-General, Rory Truell who was present at the event said, “This is a major honour for Silvana and also for the International Federation of Social Workers. It is very rare for a social worker to be recognised with such a high-level distinction and a real testament to all the work that has been carried out within the Latin American and Caribbean region. IFSW congratulates Silvana and all the social workers in raising the profile of the profession”. Also in attendance at the ceremony was Larry Alicea, Vice President of LAC, representatives from the Association of Social Workers in El Salvador, social workers, students from several universities and the senior academic staff from the Andrés Bello University.